The other night, my BF’s brother came over to visit and ended up staying for dinner. I really enjoy having guests, even unexpectedly, and I try to keep the freezer stocked with fast yet fun items I can warm up quickly. I had three-cheese lasagne and garlic bread ready to go. Surprisingly enough, although the items weren’t labeled “healthy”, they were very reasonable in calories and fat. I even indulged in a small piece of each rather than making a separate meal for myself. The grand finale was dessert, something I thought up on the way home, knowing my BF’s brother might join us for supper. 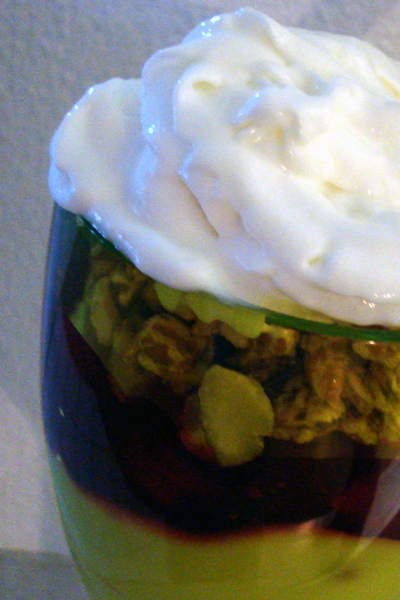 I picked up some sugar-free pudding and no-sugar-added cherry pie filling and created these yum-tastic Cherry Almond Parfaits. 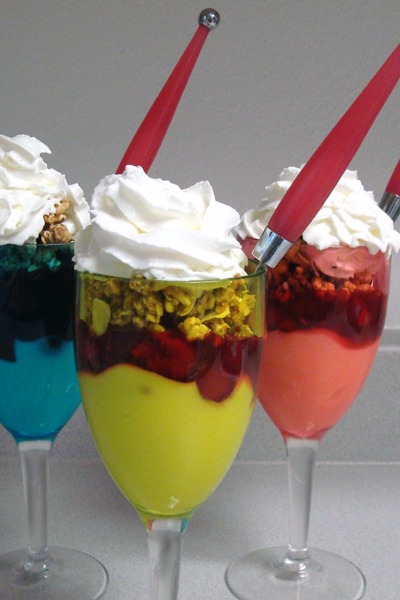 Serve ’em up in a pretty glass, and you’ve got a spectacular happy ending. Top pudding and pie filling with Kashi.